At nearly 6 inches across, my rummage sale find of a spatula is quite impressive! I’ve always wanted one of these, but just never found one that seems just right. The brand new ones always have longer handles and seem unwieldy. This one, found just last week at our local Humane Society rummage sale, has a nice short handle, with a very dense, wood-like handle with smooth rivets to hold the metal. It feels good in the hand – always an important criterion for a hand tool of any sort. This vintage version was worth waiting for. 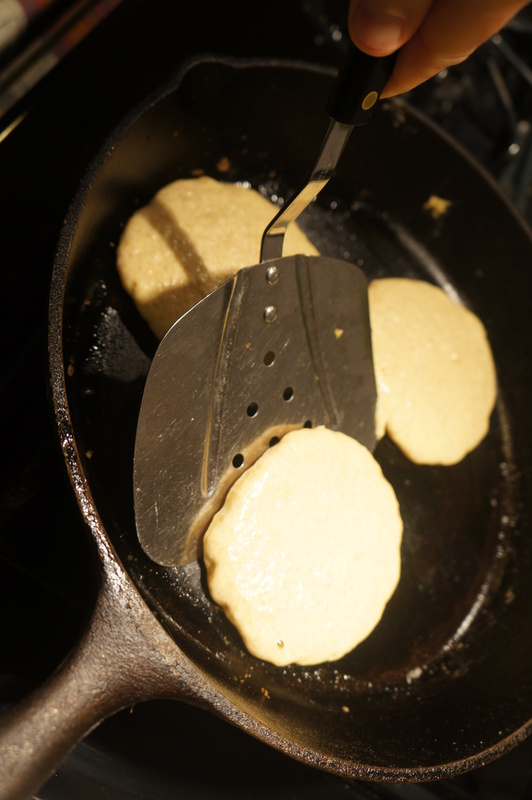 Trying it out on pancakes yesterday morning was a revelation. Such ease to accomplish the flipping task! Each whole cake fully supported – nice! I think this will be great for fish fillets too. It was definitely worth the $1 price tag and the space in the drawer. Sometimes I use a variety of flours. Yesterday was a combination of spelt and corn flours. Also, I skipped the melted butter and just used watered down cream for the milk which held plenty of fat. That way the recipe comes together super quick. This recipe is very adaptable to lots of variations! My neighbor wondered if I wanted to buy her fancy-shmancy countertop hot air oven. She was cleaning out her house after losing her husband; reorganizing everything and getting rid of things she doesn’t use. Hmmm…there’s the rub. She didn’t use this contraption, and yet, she thought I might want it. Little did she know how much I detest unused kitchen gadgets/appliances. Here is a picture of my kitchen sink area right now. That’s the French press coffee makers from this morning, the food processor and mixer bowl with assorted measuring cups and spoons from a batch of granola bars I put together, and the blender parts from a lunch smoothie I made all drying after their washing. 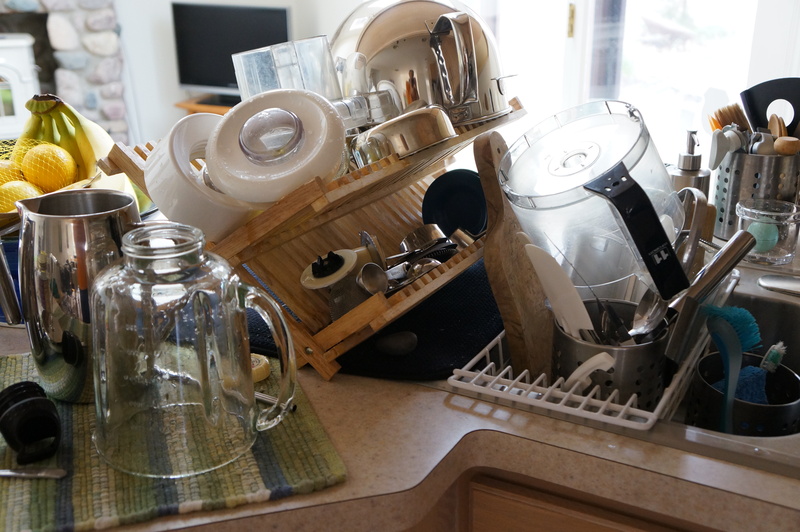 I do have quite a few gadgets and appliances for the kitchen, but I use them all. And I love it best when I use almost all of them in the same day as here! Whenever I hear about or see some new amazing gadget that will make my life wonderful, I try to think hard about how it will be either better than what I have right now, or how it will completely change the way I do something for the better. Well, a countertop hot air oven? Why do I have a regular oven, then? How will I store it? Probably way deep underneath somewhere or in the basement. That’s a recipe for never using it! These items above live on my kitchen counter or on the cart that gives me more counter space right there in the kitchen. I don’t have to bend deeply or do stairs to get at them. When I was getting married my aunt wanted to get me an electric frying pan. This is a nonsensical idea to me. I have a stove and frying pans. Why would I need an electric frying pan in addition? I had to talk hard and fast to get her to see my point of view. She couldn’t imagine life without one. I told her I would return it and buy something I really want! The pan never materialized. Same story with “high ball” glasses. She said, “But what will you do when you have someone over who asks for a high ball?” I said, “They will drink what I have available. I will never have high balls available as I don’t plan on having a fully-stocked bar!” I guess in her day that was a great faux-pas. Now I think people are fine when you say what you have and they pick from the list of available drinks. Poor auntie, I wasn’t very nice about it even then, 20 years ago. I’m a fierce defender of my small kitchen storage space! I have been lured by the idea of a great new gadget, though. For a time I was a consultant for a home party-based kitchen gadget company. I acquired many of their products. By now I have decommissioned most of them. The keepers? Stoneware pans. I love them. A killer garlic press and a few other things. Not much, though, as much of it was made of plastic or nonstick surfaces. I’ve gotten rid of anything that could poison me! A small kitchen can work really efficiently with tools that are actually used to make the jobs of cooking at home easier. I always like to think of how much money I save by cooking at home instead of eating out. The savings definitely more than justifies any kitchenware purchase that will get used and save effort.